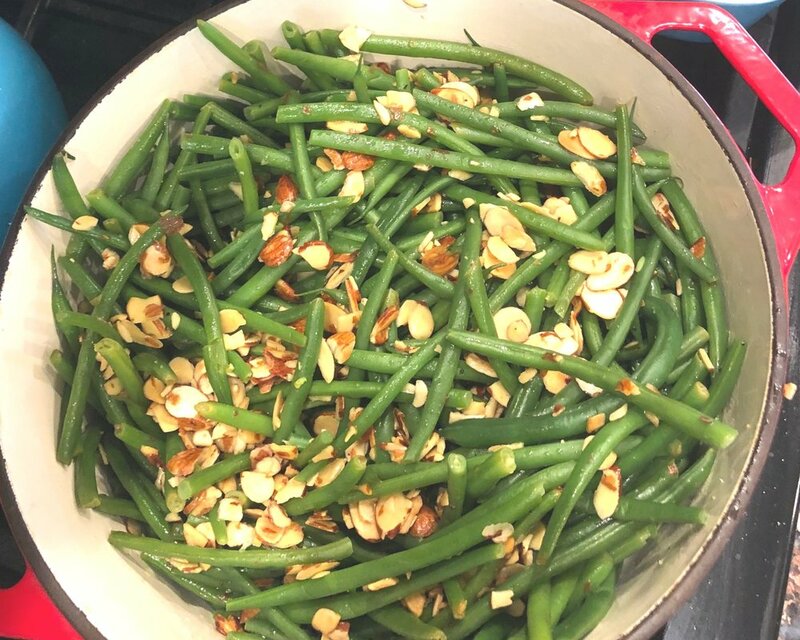 Green Beans Almondine is a healthy easy side of crisp-tender green beans coated in a simple sauce of butter, lemon juice, and toasted almonds. Looking for a healthy and delicious side dish to make for your next meal?! BONUS it only takes 15 minutes to make AND has only 5 ingredients. WINNING! I made this for our Easter Feast and it was a hit all around. Everyone including the kiddos, loved it. 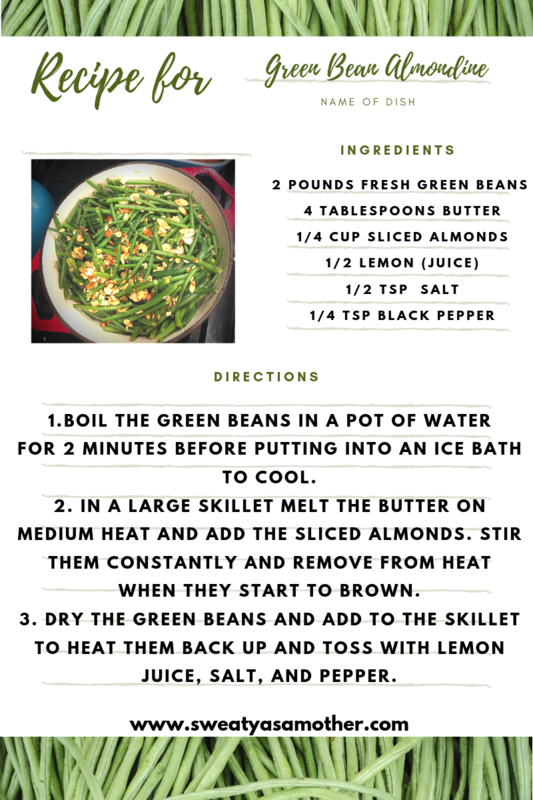 we have been having it as leftovers and the almonds do get a little soft, so I recommend reheating in a skillet and it tastes just like it did on Easter! You may be asking what is Almondine?! because when I saw it on pinterest, I had to google it. This is what I found. It is also known as “amadine” and is a sauce made of almonds cooked in butter, seasoned with salt, pepper and lemon juice. When cooking the almonds in the butter be sure to watch and make sure they do not burn (this can happen quickly if you are not careful. I had never done this before when cooking green beans. I have only ever done this when hard boiling eggs, but I am telling you it made them perfect and they were just the right amount of crispy and not mushy at all. I definitely don’t recommend skipping this step because you need to stop the cooking process after you boil them and then saute them. these popsicles are packed with nutrients and your kids will LOVE them! delicious gluten-free chicken veggie ramen that the whole family will enjoy! Based on the recipe from Cooking light , I made this edamame succotash for dinner at our friends and it was a hit. We enjoyed it with a delicious tri tip and steamed beets. It was super simple and I only changed a few things. I also doubled the recipe to make enough for 5-10 people. 3. Add edamame and cook for about 2 minute then remove from heat. Transfer to a bowl; cool 10 minutes. a hearty and delicious dinner! Add this to your weekly meal prep! takes less than 10 minutes to prep! Tonight, grab your sheet pan, and throw together a quick and delicious dinner the whole family will love. This will only take you 30 minutes and clean up is easy! Spread your broccoli and bell peppers onto a sheet pan, drizzle or spray with some oil and place in the oven for 15 minutes. After 15 minutes, remove sheet pan from oven. Move veggies to the sides and place chicken in the middle. Put sheet pan back into the oven for another 20 minutes. While chicken is cooking, put all sauce ingredients into a small sauce pan. Let it simmer until timer goes off for chicken. Add the cashews to the pan and pour the sauce all over the top. from Confessions of a Fit Foodie! delicious for dessert, breakfast or a snack! easy and delicious lunch/dinner, whole 30 compliant. Try doubling it so you can enjoy them as leftovers. Heat a large skillet over medium heat. Add the sausage and cook thoroughly. Do not drain it! Add the coleslaw mix, garlic, ginger, and coconut aminos to the skillet with the sausage. Cook for 4-5 minutes or until cabbage has softened to your liking. Remove from the heat and top with the green onions and sesame oil. Stir to combine.